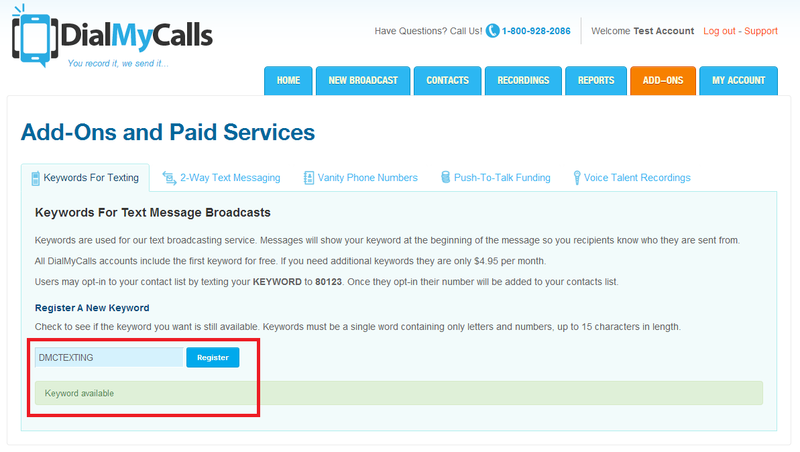 In addition to sending voice broadcasts, DialMyCalls members can now register a free SMS keyword and send out text message broadcasts. Text messaging is becoming more predominant in today's society when it comes to communicating with one another. 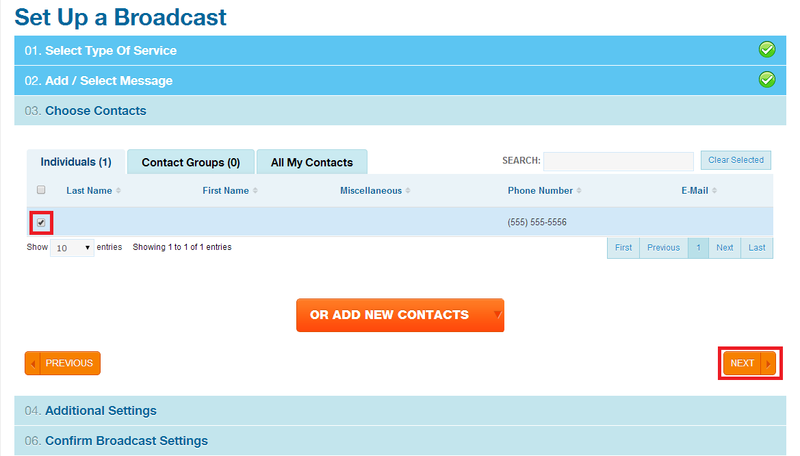 DialMyCalls offers, in addition to voice broadcasting, the ability to send out an SMS broadcast to a list of contacts at once. In conjunction with our text broadcasting, members will receive one free SMS keyword that is used as an identifier for their message recipients. Utilizing the DialMyCalls text messaging service also provides an opportunity for non-profits, businesses, sports leagues, and various other types of organizations to build a contact list – every keyword includes unlimited opt-ins. Promote your keyword by sending out a newsletter, bulletin or in-store advertisement telling everyone to "Text 'YOURKEYWORD' to '80123' to receive weekly updates and news." Once opted in, a contact list will be created at which point in time you will be able to send those contacts text message updates. 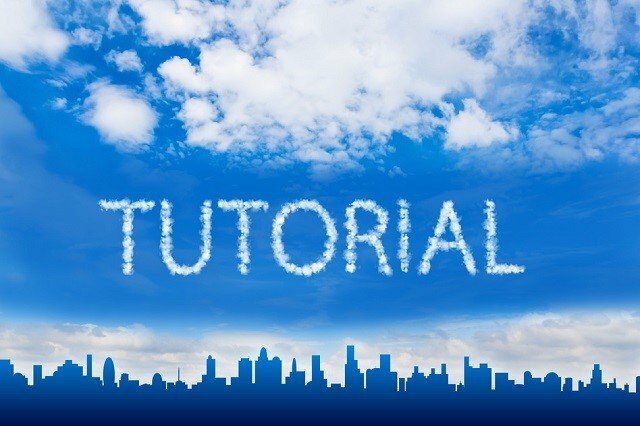 Step One – Login to your DialMyCalls account and click on the following: "Add-Ons" → "Keywords For Texting"
Step Two – Register a new keyword by searching our database for available keywords and then clicking on "Register". 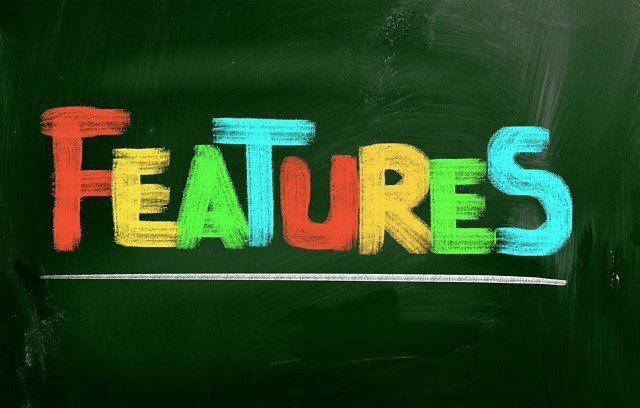 Please keep in mind that only the first keyword is free – additional keywords are $4.95 per month. 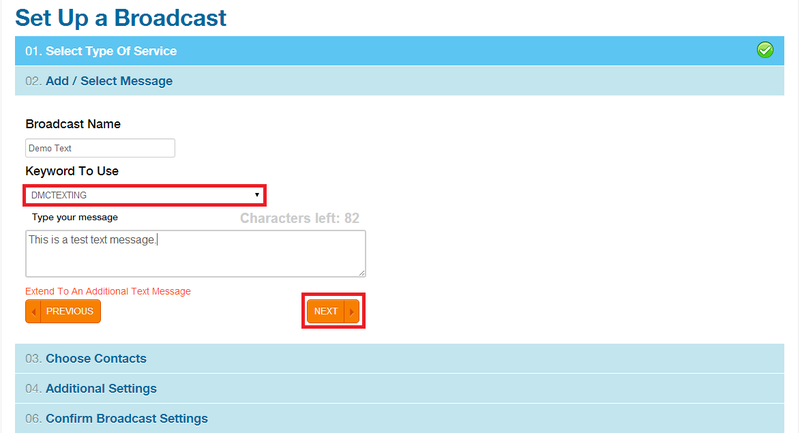 Step Three – Once a keyword is registered, you can now start sending out SMS Broadcasts by clicking on the following: "New Broadcast" → "Use Text Message Broadcasting Service"
Step Four – Name your broadcast for your records so that you can go back into your account at a later date and time to find the results of a certain text message. Select the free keyword that your registered in step one from the drop-down menu. Finally, type out the text message that you would like to send out to your recipients and click "Next". Step Five – Select existing contacts or add new contacts that you would like to receive your text message broadcast and then click "Next". 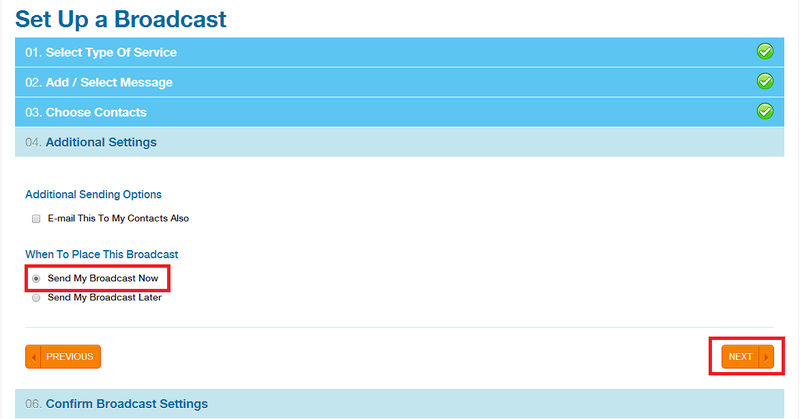 Step Six – Choose whether or not you would like to send your broadcast out immediately or schedule it for a later date and time and then go ahead and click on “Next”. Step Seven – You are now on the final step! 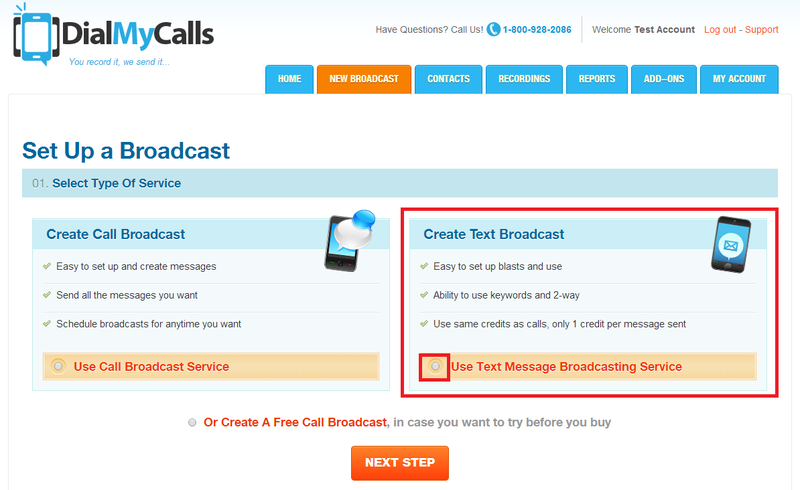 Confirm the details of your newly created text message broadcast and once everything is verified, click on “Send Broadcast Now” – you have now just sent out an SMS broadcast using DialMyCalls! 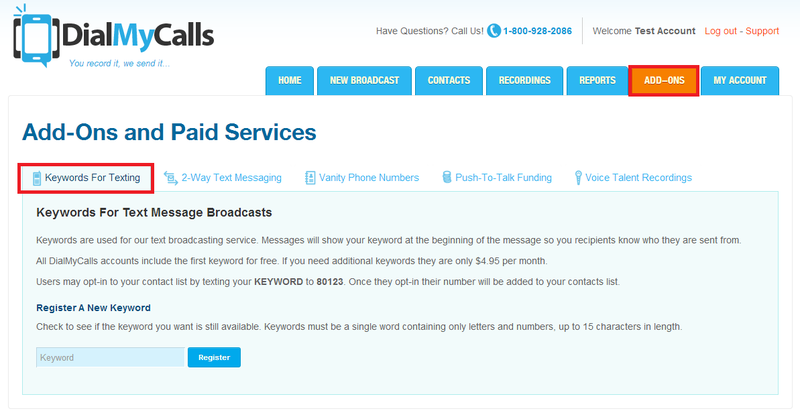 Every member that signs up for DialMyCalls will immediately have the ability to set up a free SMS keyword. In order to utilize your free keyword and our SMS broadcasting service, credits or a monthly plan will need to be purchased. 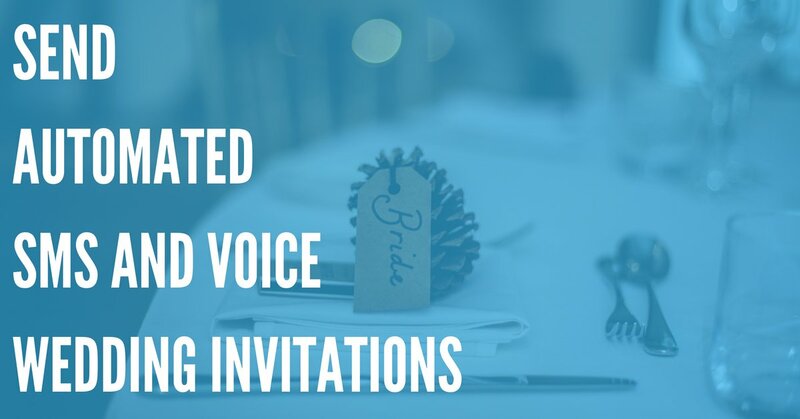 Create an account today to help your church, sports team, non-profit, small business, or organization stay informed via voice + text message broadcasting. 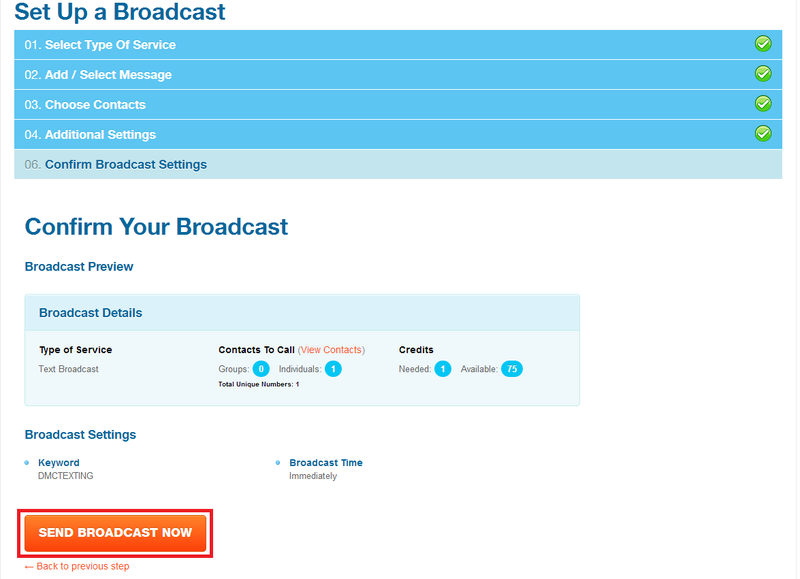 For more information regarding DialMyCalls' SMS broadcasting, please visit www.dialmycalls.com or contact our customer support team via phone or email.